The news today that the Labour Party is pressing the Tories on their plans to repeal the 2004 Hunting Act has left Hubert rather conflicted. Despite the manifest craziness of much of New Labour's 'if it moves, there ought to be a law about it' mindset, Hubert is a life-long, more-or-less tribal Labour voter and tends to grind his teeth and spit profanity at the prospect of the Tories getting back into power. That being said however, the Labour Environment Secretary Hilary Benn basing his opposition to the repeal of the Fox Hunting Ban on the basis that, 'the ban has worked and is supported by a majority of the population' strikes me as a flawed argument given that the overwhelmingly urban population of the UK can't seem to get their collective voting heads into a place where they can sympathise with positions that seem blindingly obvious to the minority rural population. Central London estate dwellers, for instance, are largely unable to see that a blanket ban on possession of air rifles could be anything other than a good thing if it lessens the possibility of their being sniped at on their way to Tesco's by a sociopathic teen in a nearby tower block; so they'd be quite happy to vote for such a ban despite all the rural folk who see air rifles as an ordinary and safe tool for reducing the damage to crops by vermin as well as a way of getting meat to the table. So in the case of air rifles to say that the 'majority of the population' would support a ban would be to justify a poor political solution on the assumption that a simple head-count is a dependable path to the legislative good of all concerned - and it just isn't. With the fox hunting ban though - and I should qualify this by admitting that I know approximately sod all about the actual practice of this kind of hunting - I'm really not so sure. I can't honestly see that if the aim is to reduce the predation of foxes upon livestock that this isn't better acheived by people simply shooting them in areas where this is a problem - rather than by assembling a giant armada of dogs, horses and fancy-dress riders to chase them across the fields. I understand that the hunts are enmeshed in the rural economy and have a centuries-long tradition behind them but I can't take this by itself as being a conclusive argument for supporting them since there's nothing to stop a tradition, as such, being a thoroughly dumb thing; slavery, the subjugation of women and the death penalty being only the first few of the many 'noble' and now justly-rejected traditions that come to mind. So to argue that fox hunting is a traditional pursuit doesn't do much to persuade me that it's therefore a good one; in fact, I'd say it does nothing. Fox hunting was banned in England, I guess, largely because it was seen to be cruel; the dogs, when and if they finally find their quarry, kill them in the way that a pack of dogs will and there's much scope here for arguing that this is a 'cruel' practise - by which I suppose I understand a 'less-than-ideally-humane' one. Well, maybe. Foxes, when they find their way into chicken runs aren't themselves noted for the ideally humane way in which they dispatch their own prey - typically tearing the heads off the whole brood before making away with just one of them. Perhaps it's tricky for the Tesco-bound Islington shopper to understand that if they want a nice, 'ethical' free-range egg for their breakfast - and one that costs less than a fiver each - then foxes are, like it or not, going to have to be controlled somewhere along the line. This might be so, but to say this still doesn't, in my book at least, make a great argument for the control of foxes via packs of hounds and crowds of scarlet-clad folk on horseback. 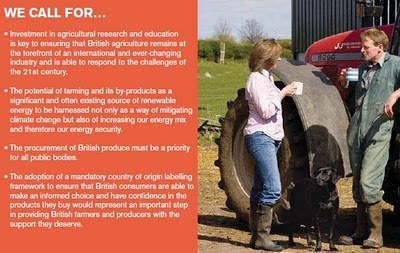 The Countryside Alliance (their manifesto here) is an organisation in the UK that campaigns for rural issues and is actively supporting the repeal of the Fox Hunting Ban. I read their manifesto this morning and while it's a little scanty on details it does state positions with which I'm sympathetic. They put the rural point of view very well and I can see that this is something that does genuinely need to be done, but even so I can't quite follow them in their unqualified support for a straightforward repeal of the ban. I do also, I confess, have something of an instinctive knee-jerk response against the Countryside Alliance, since I felt them, a few years back, to be little more than a front organisation for the Conservative Party. This, I have to say, was mitigated a bit this morning by reading their manifesto, finding myself agreeing with much of it and realising that their Chair is now the Labour MP Kate Hoey. As a lifelong Tory, I will not be voting for David Cameron over this issue. In fact, I decided to campaign actively against the repeal. The problem with the hype from the Countryside Alliance is that they actually don't represent everyone in the country, but rather just the pro-hunting element and perhaps those who are unaware that millions have been spent on trying to overturn the act in several courts, rather than save their post offices. Many farmers tell us that they are sick to death of the hunts trampling their land, causing massive damage, intimidating them if they complain, and using this issue to divide them politically from their urban friends who actually do care about the real issues affecting them. As the Burns report concluded, lamping is the most effective way to dispatch a fox - if and when necessary. 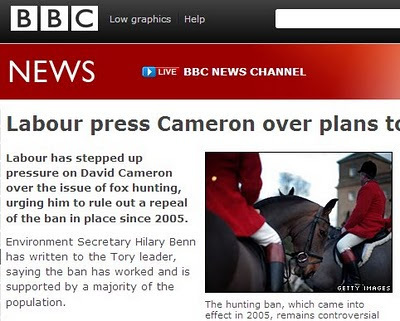 If the hunts would stop breeding them for their sport, of course, it would certainly be less often 'necessary'. Then of course, there is always our campaign website: www.campaignfordecency.org.uk Just in case you want to sign the online register to support our cause. That's a tremendously informative and helpful comment. Thanks very much for taking the time to write it and supplying the links. Well, it helps to hear both sides of the argument and we need all the help we can get if Cameron gets into power with a majority. Ah, HH, you have stepped into a strange parallel universe full of very angry people. Good luck mate! My Parents in Law are farmers and apparently have never really seen eye to eye with the local hunt for reasons they have experienced similar to those mentioned by mhayworth above. That said, a law so badly written and rushed in to pacify the wants of the'Chocolate box countryside' folk and the Guardian reading inhabitants of Islington coffee shops, deserves repeal, if simply (though I hope not) to rewrite it so that it looks more like a law fit for purpose than the colander it resembles currently. My own view is one similar to the greatly missed Keith Floyd on another tradition, 'I don't support Bull fighting but I do support a Spaniards right to fight bulls should they wish'. I enjoy and support shooting with shotguns and air guns through the BASC. I find ferreting distasteful, as I do snaring, coursing and trapping. That said I wouldn't try and ban them. They are simply other ways of achieving the same end... food or protection of produce. Fox hunting is in exactly the category above and although not an active participant, I support it for that reason and for the reason that there seems to be just as much reverse snobbery, ignorance, bullying and scaremongering in the anti's camp as they claim there is in the pro's. It as wrong to fox hunt as it is to shoot or to force a cow through the process of killing it at an abattoir. We are omnivores and therefore most of us choose to eat meat. If we accept that something has died for us to eat steak, then we must also accept that the same has happened for us to enjoy free range chicken (foxes) or cereal crops etc. (rabbits, pigeons, rats, etc)and there are several ways to achieve this, mainly through controlled dispatch of the offending animals. It is about time we accepted these facts of life in this country and stopped trying to distance ourselves and our children from the realities of food production. Anyhow, that's my soap box thoroughly warn through, thanks HH for the opportunity to take part in a lively and emotive debate on both sides. Thanks James (Marchington) and well, if it's a lively discussion, so much the better! Thanks James (2) - it's great to get thoughtful and interesting comments such as yours, many thanks for writing. Our folks removed the fox element (which was perceived as cruel round here). The part of the prey is played by a rider (On a red horse most times) who is chased across the the countryside by his pals. This way no foxes get torn to pieces. Taking part in the action has become cheaper since it is no longer required to bring dogs to find the "fox". I think that this way of fox hunting is a bit more honest as the message is: "We don't need no foxes as excuse to trample other people's fields, we can admit that we do it just for the fun of it.". When it comes to the tradition of the sports, one should point out that this way of hunting has been developed in a time, when not only the land where it took place, but also the peasants that tilled it belonged to the participating aristocrats.